In order to meet the QEP expectations, students should be provided with many opportunities to perform these types of activities. School A has a limited amount of glassware, tools, and measuring devices available in the lab due to to financial constraints. School B has no lab technician and therefore equipment isn’t maintained or is underutilized because teachers need assistance in preparing for their experiments. School C finds it difficult and costly to ship the standard chemicals and other specialty materials because it is in a small, remote community,. As an online teacher for LEARN, I simultaneously teach students that are in multiple locations around the province. Some of them are in remote communities. Some of them are in small urban schools. Students are doing labs without me being physically present to support and supervise them. Fortunately, there are many creative solutions to providing students with authentic lab experiences even in the face of these challenges. There are a number of engaging, interactive, virtual labs available to students and teachers. Some of my favourites are ExploreLearning and PhET. My Science and the Environment students use ExploreLearning to investigate the effect of temperature on the solubility of a salt. My Chemistry students use the PhET simulations to investigate the effect that temperature and concentration has on the rate of a reaction. Students are involved in predicting the relationships and can even design their own investigations to discover what types of chemicals are electrolytes. Both websites have inquiry-based student guides already designed for teachers to use with their classes. My colleague Andy Ross recorded several physics labs that may be used with classes where lab equipment is scarce or unavailable. They include brief introductions to each investigation, an overview of what materials are being used, and footage of Andy actually doing the lab. Real values are given, so students can take this data to perform required calculations analyze the results, and form their own conclusions. Ray Venables, a teacher with ESSB, also recorded a collection of videos that may be used for such investigations as identifying physical vs. chemical changes, classifying substances as metals, metalloids, or non-metals, and performing acid-base neutralizations. There are often creative options to science labs that use relatively simple materials. Kitchen science is engaging for many students; after all, it involves materials that they are exposed to every day at home. 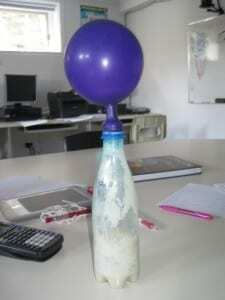 For example, my chemistry students have predicted the amount of carbon dioxide produced when sugar is broken down and tested it using very simple materials (sugar, water, yeast, a small water bottle, and a balloon). What are the challenges for providing authentic labs or inquiry-based activities at your school? Do you have other ideas for creative solutions to these challenges? Please add a comment to share! Very interesting read, Kerry. I have often wondered how our science teachers managed labs in the virtual classroom. But once again, solutions for the online class would work just as well in a brick and mortar class. I also think that your creativity shows in the blog posts you get your students to do, like the Dalton’s Law one about Lego! Great ideas all around!